The Buddha Amitabha 10 Levels teachings come from the Namchoe tradition, using Tibetan texts from the 17th century treasure revealer Mingyur Dorje. 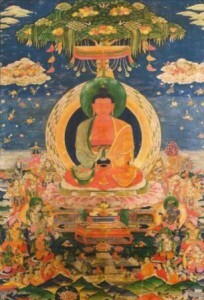 These teachings encompass the complete path of Buddhist meditation practice, including calm abiding (shamata), the development stage of visualizing oneself as a deity surrounded by the Pure Land of Amitabha, the completion stage of resting in the true nature of mind (rigpa), and the union of development and completion stages together. Included are teachings on Dream Yoga and Clear Light Yoga, both components of the Six Yogas of Naropa (see also Phowa). “As for the Buddha lands, there are countless Buddha lands or purelands according to the tradition of Buddhism. All these countless Buddha lands are included in the five Buddha lands associated with the Five Buddha Families. Basically, a Buddha land is a manifestation or personification of the timeless awareness of enlightened beings. From the perspective of ultimate reality, all enlightened beings are unified in the great expanse and there are no distinctions in the state of timeless awareness. The five Buddha lands of the Five Buddha Families are connected to the body, speech, mnind, qualities and activities of enlightened beings. The Buddha land in the west associated with Buddha Amitabha is known as Sukhavati or Dewachen and manifests from discriminative wisdom, the transformed state of attachment or desire. There are many reasons why the western Buddha land of Dewachen can be said to be more excellent than the rest of the other Buddha lands. For instance, because Buddha Amitabha made great aspirations so that ordinary sentient beings with negative karmas and afflictive emotions could also be born in the wester pureland, it is easier to be reborn in the western pureland of Buddha Amitabha than in other Buddha lands. In general it is not otherwise possible for an ordinary being who still has negative karma and afflictive emotions to be born in a Buddha land. Making supplication to Buddha Amitabha is tremendously beneficial because the blessing and activities of Amitabha are incomparable to any other enlightened beings.